To avoid running out of J Channel, install all longer lengths first, and then use cutoffs for these shorter segments. Square cut a J Channel piece to Distance “A” plus 2” long (for trims provided by ABC use 1-1/2” to Distance “A”; McElroy 1-3/4”). Next install vertical J Channel pieces along front and rear faces of rafters. These piece lengths will vary depending upon roof slope and rafter size. Top end (fitting tight against roof steel) will be square cut. Lower end will again have bends each cut, with snips, up 1”. 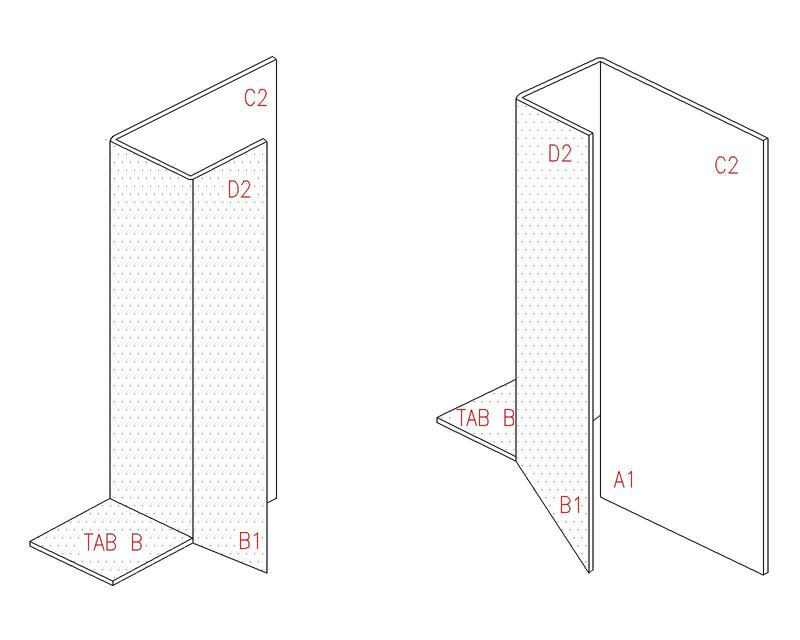 Fold area between cuts to form a tab. 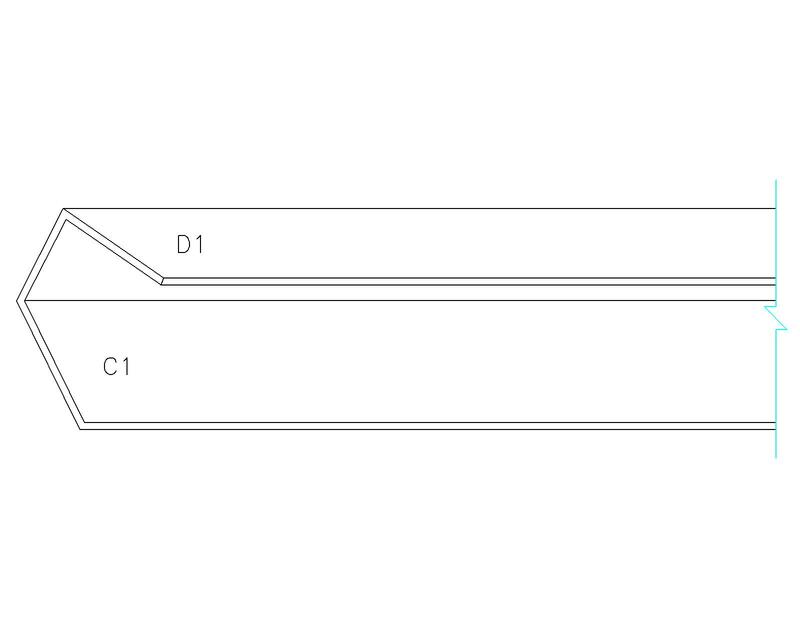 1” J Channel face (3/4” face for ABC trims, 7/8” for McElroy) is to be cut at a 45-degree angle. Face B1 will be on top of Face B2; C2 will be behind C1 and D2 behind D1. Carefully determine where rafters will lie along sidewall steel. This can be done by installing full-length panels along wall until a rafter is reached. 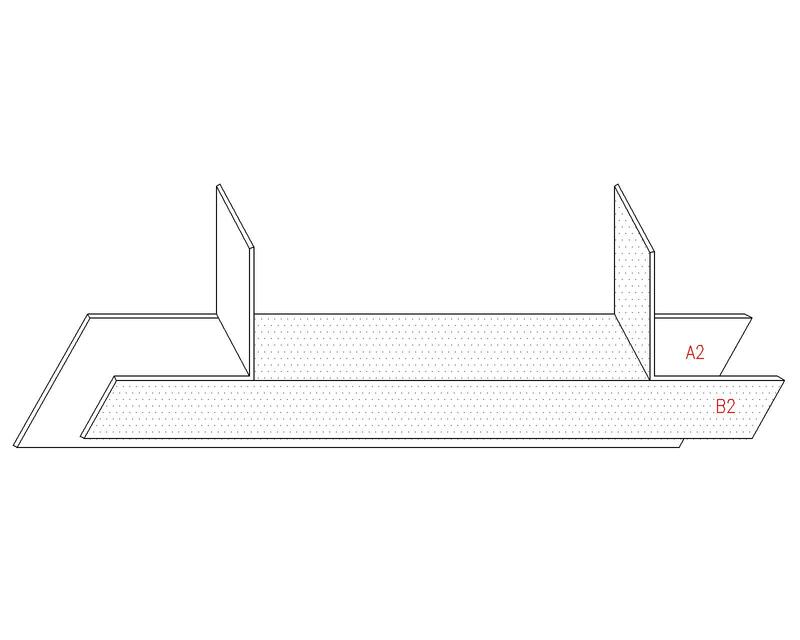 Easiest, if grade allows, slide panel to be cut up against trimmed out rafter assembly underside and put light pencil marks on steel to align with front and rear faces of rafter assembly. When done properly, no light will shine into building from this area. If light does show through, use an appropriate mastic or caulk to seal area thoroughly. 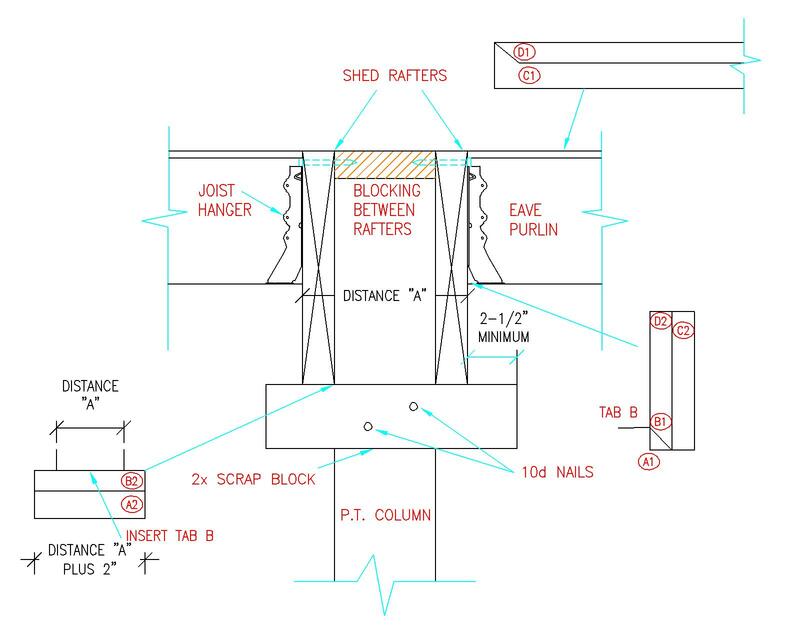 This entry was posted in Pole Barn Questions, Constructing a Pole Building, Pole Building How To Guides, Steel Roofing & Siding, Pole Building Siding, Sheds and tagged j channel, Hansen Pole Buildings Construction Manual, rafter tails, eave wall on April 12, 2019 by admin. Roof – each high rib side at Eave Girt and Ridge Purlin (as well as at any end over end splices). Use 1-1/2” long diaphragm screws at eave purlin and ridge purlin, installing one screw on EACH high rib side (unless instructions state otherwise). If double screws are used at any other locations, there will NOT be enough screws. Use a diaphragm screw next to each high rib (one side only) on field purlins. These will be 9” on center, with first screw next to overlap rib. This language also appears on the blueprints for every Hansen Pole Building which has steel roofing or siding. As not everyone is a reader, a handy diagram is also provided so as to clarify any possible confusion. “This client thinks he is short screws for the roof, would you run a quick count. He feels he should have received 2618 screws for his building”. As usual, I start with the premise of we must have done something wrong, so I did a complete breakdown by hand. This client’s particular building is a monitor style (https://www.hansenpolebuildings.com/building-styles/monitor-building-designs/). “I am unclear about what each of your numbers represent, it looks like this was calculated by linear foot per panel, but that would be incorrect. For the main roof that makes 8 screws on each end (2×8=16), and 5 screws for each remaining purlin (5×3=15). That makes the total 31 screw for each sheet of steel. There are 17 sheets on each side of the main roof, equaling 34 sheets x 31 screws each = 1054 screws for the main roof. 1564 + 1054 = 2618 total screws. The client told me where he went wrong – It is FOUR screws for each remaining purlin (36″ width / 9″ o.c. ribs = 4). Somehow he is using (or planning on using) a fifth screw. The instructions on the blueprints even go so far as to specify the field screws as having four per panel. The Hansen Pole Buildings Instant Pricing™ system is not perfect, but is pretty darn accurate. Assembling one of our buildings and find something which isn’t adding up? Contact us before it is too late and additional materials are needed to resolve the issue. This entry was posted in Constructing a Pole Building, Steel Roofing & Siding, Powder Coated Screws and tagged powder coated screws, steel roofing screws, Hansen Pole Buildings Construction Manual on October 21, 2016 by admin. This is part three in a three part series on how to better ensure a great pole barn project, by getting rid of the pitfalls. I’d like to thank Bret Buelo of Wick Buildings for the basis of this article, which appeared on the Wick Buildings website (www.wickbuildings.com) August 12, 2016. Information from Bret’s article appears here in italics along with my own input as well. Wick Buildings is highly rated by the Better Business Bureau and has been an NFBA (National Frame Building Association www.nfba.org) member for decades. Part of the fun of any DIY project is learning new skills to complete a project. However, there is a point where you venture too far into the unknown and begin to cost yourself time, money and perhaps even your own personal safety. If you’re a DIYer with lots of time on your hands and potentially cash to burn, by all means, you can take a shot at any pole barn project. But if you’re on a budget and time is of the essence, there are tipping points when you can find yourself in over your head. Many pole barn jobs can get extremely complicated, and if you’re not careful, can lead to some significant mistakes. We reached out to Gordon Sebranek, who manages the Engineering Department at Wick Buildings, for some insights. Following are the last three of nine potential pitfalls he outlined to help you decide if you’ve bitten off more than you can chew. General building training and experience is great, but there are also specialties within post-frame construction that require a different knowledge base. For example, free-stall dairy setups involve a number of unique parameters. And these specialized projects tend to also require specialized equipment. Guru comments: For those rare and unique projects, this may be the case. The Hansen Pole Buildings Construction Manual includes numerous tricks to a successful end result which are the product of experience of those who have constructed over a hundred thousand buildings. They are tried and true methods which allow the average DIYer to build like a pro. This category is entirely subjective. As we mentioned earlier, if you have unlimited time and money, then you’re never really in over your head. But if you are on a tight timetable or budget, you may soon find yourself in some serious soup. Gordon notes that the length of a project depends on the specifics of the size and complexity. He’s seen an experienced person design a 30 x 50 building in two hours. “Some jobs might take six weeks, because they’re very involved,” he said. Project durations become longer depending on your experience level, too. Do you have the patience to teach yourself how trim out a building nicely, and to correct mistakes if and when they happen? Guru comments: Tight time tables often occur when trying to hit the window of opportunity for a high quality post frame building contractor. When I was a building contractor, there were certain times of the year when it could be six to eight months before we had a construction crew available to put up your building. Put structural design in the hands of the experts and you will be time and money ahead. Please – I implore you – do not attempt the structural design of a building on your own unless you happen to be an RDP, and even then, you might be ahead to farm it out to the specialists who do nothing but post frame buildings every day. Doing things like cleanly installing trims is as easy as opening your Construction Manual and looking at the details and photos which walk through even the most challenging of applications. And in construction mistakes can and will happen. I used to employ the best post frame building crews in the industry (in my past life as a pole building contractor). Even then, I’d see a crew blow half a day of time on something which could have been handled in five minutes by contacting the office for assistance. This is why Hansen Pole Buildings offers free unlimited technical support via email during the construction process. 99 out of 100 times the answer was right there in the Construction Manual to begin with, but when something goes awry, it helps to have the experts near to give you the answer you need to quickly move forward. You’re in over your head when you don’t have the appropriate safety tools to protect yourself on difficult jobs. Or, more accurately, when you don’t know what you need to do to protect yourself. Wick Builders and the outside contractors that they work with adhere to OSHA requirements. Safety is the top priority on every job. It’s our opinion that if you don’t know the safety requirements for every job, then you are in over your head. You only go around once, folks. Don’t short-change the safety requirements for a construction job. Guru comments: I heartily agree. Safety is paramount in any construction project – my Dad was killed in a construction fall in 1988, so I am very sensitive towards avoiding injuries. OSHA (or state versions thereof) has many good ideas for safety and they consume innumerable hours of having to do paperwork – all of which the consumer pays for when they hire a contractor. For the most part, use common sense and play it safe. If you can fall more than a few feet wear a properly secured harness. Most post frame building projects can (and should) be built on a DIY basis. This is a great way to take pride of ownership and get more out of your building dollar. Once again I’d like to thank Wick Buildings for their contribution to this blog series, and to the fine art of pole buildings in general. This entry was posted in Pole Barn Design, Pole Building Comparisons, About The Pole Barn Guru, Pole Building How To Guides, Pole Barn Planning and tagged post frame building, Wick Buildings, Gordan Sebranek, Hansen Pole Buildings Construction Manual on September 9, 2016 by admin.